The Lord and I have had a grand time here these past 5 days. It’s been a time of reflection on the journey here as well as time given to the life I will start tomorrow when I reach Busia. But more importantly, I’ve just been. Isn’t that a crazy sounding statement…I’ve just been. One day has floated into another and the depth of peace and contentment has been surreal. I think the year of preparation although so worth it all had taken a toll on me physically and emotionally. It wasn’t until I had been here for a couple of days that I realized just how long it had been since my burdens were light. It’s been just a little over a year now that I surrendered to serve in full time foreign missions. When the process began as you can imagine I was overwhelmed. Now looking back I can see why. In the past year a lot has happened in my life. This is one of those times I know if God had of shown me the path to get here, I would have turned and ran because I wouldn’t have ever thought myself strong enough to go through the process it took to get here. Selling my belongings, leaving the security of my job, leaving a great church, and most of all the heartache of leaving my family. Yes, I would say much has gone on in my life in the last year and the Lord knew I needed to just be! Now it makes sense doesn’t it….I’ve just been. Each day since I’ve been here I kept thinking the Lord was going to show me some great revelation or something, but then I realized He brought me here because I needed time to not only rest, but to be emotionally and physically ready for the changes in my life that will begin tomorrow. No matter the challenges the last year has brought, tomorrow will begin a journey of new challenges that I’ve not yet faced. However, along with those challenges will come incredible blessings. I’d like to share a very personal challenge in order to share a mighty Praise for my Heavenly Father. I became a full time missionary the first of October, just before my first trip here to Africa. When I returned I was not prepared at all to experience a lack of financial support. I don’t think myself naive, but I sure didn’t have any idea how hard the next few months would be for me. November and December were toughest. Neither of those months was there sufficient funds to cover what small expenses I still had to live here before leaving full time. When you’ve been on your own as long as I have, it’s not an easy thing to tell others when you have a need. I had always been on the other end of making sure everyone else had what they needed, I truly didn’t know how to ask for help. There were so many people who would have helped me, but I didn’t know how to ask, so I truly struggled to even have enough food or gas. I remember how sad I was when I had to make the decision to stop attending the weekly bible study I had been attending for years, because I just couldn’t afford the gas. After the beginning of the year the support began to increase and I was so thankful. It still wasn’t where it needed to be for me to fill confident enough to leave for Africa, yet God continued to say press on, don’t stop. It was an amazing thing because when I needed to buy my airline tickets, the money came in. When I needed to pay for language school the money came in. God was sending it as I needed it, yet there was still nothing left over after I’d paid for tickets and school. In February just before I left enough came in for me to buy what I needed to take and to have the cash I needed to take with me. I don’ think I will ever forget what it felt like the day before I left when I checked the balance in my accounts. There was $41 in savings and $474 in checking out of which my last couple of bills had to be paid. I remember thinking people would think me absolutely crazy if they had any idea that I am getting on a plane tomorrow and the money is not there for me to live once I get to Busia. But from the depths of my being, I promise you that I never for once thought about not getting on that plane. God had shown me time and time again that He would provide for me. I wish I could remember where I read this so I could give credit to them, but I read somewhere about a missionary who said why should God give us what we need in the future, why should we worry about what we will need next month or next year. If He is going to provide, there is simply no need in worrying. I’ve written this very personal message in order to share that I serve a Mighty God who provides for my needs. Yesterday I received an e-mail with the total dollar amount of support that had come in this month and my heart just about stopped from the shock of what I read. More support has come in the past 4 weeks than all the months added together since I have been serving fulltime. Sweet friends, let this encourage you to not let anything stop you from doing God’s will in your life. I am a better missionary because of the challenges He let me experience. I am better prepared to live on meager means just as those I am here to serve live on. My faith has magnified many times over in the past few months and I wouldn’t change any of the challenges because God knew I needed those lessons that I couldn’t have learned any other way. I’ve been safely delivered to the next stop on my journey. I arrived this morning at the Inn where I will be staying until my flight out to Uganda next Thursday. Pictures do not describe how beautiful this place is. The first few moments after I arrived, I thought about the Garden of Eden. We have no pictures or descriptions of what the Garden of Eden was specifically like, but this place is so peaceful and beautiful that I am at a loss for words. It’s not the buildings or the furnishings, it’s God’s natural creations. I keep thinking I must be dreaming, but I don’t think I am. More than what is visible to the eye, there is a spiritual awareness here that just like the beauty, I am at a loss of words to describe. The only other time in my life that I have had such an unusual awareness to such a deep sense of spiritual peace was at The Cove, Billy Graham’s Training Center. When I was at The Cove, the minute we drove through the gates onto the property, I knew I was in a realm of protection spiritually that I had never been before. Later, I learned that all the staff and volunteers spend time praying for the guest. The housekeepers pray in every room as they are cleaning each day. What I soon discovered was the deep sense of spiritual peace I was experiencing, was a prayer covering. I don’t have any idea yet about the Inn where I am now. I can tell you that there was a bible beside my bed! I believe the Lord brought me here for something specific……..
to be continued……………. Love to all. This afternoon I had the incredible privilege to spend the afternoon at a local organization that works specifically with boys from the streets. These boys come from various backgrounds and most are not orphans in the sense that their parents are no longer living. They were orphaned by situations in their homes. This organization only takes the boys who have absolutely no where else to go. Most of them have been in other organizations, but because of their issues most often created by others, they couldn’t stay. This program is a 3 year program. They take boys who are 14 or 15 years old and try to keep them until they are 18 or so. These boys have no education, and most cannot read or write because they didn’t have the opportunity to go to school. All of these boys are small due to a lack of nutrition in their early lives. These boys are given a basic education in reading, writing, and math. Because of their lack of education the future for these boys is uncertain, yet along with the basic skills that will help them in the selling and buying of things they are taught a trade. One of the boys there, Oscar, became my new friend. We spent the afternoon walking all over the farm there just talking. Oscar can speak some English, but most of our conversation was in Kiswahili. Each of the 36 boys there have a certain cow that it is their responsible to milk and see after. We got to see 9 new piglets that were born yesterday. We walked through the garden and he knew all of the vegetable plants planted. These boys work hard in the gardens and caring for the animals because that is the only way they eat. We walked through the work shop where all of the boys are being taught a trade. I met his carpenter teacher, his welding teacher, and some of the older boys who help the younger ones. In the states, we couldn’t imagine 14 year boys working in what appears to be unsafe surroundings because they don’t have the big helmet to wear when they are welding and their carpentry shop machines don’t have all the safety switches and things. However, I believe these boys are as safe as they could possibly be. They pay attention to what they are doing and take a great deal of pride in their accomplishments. To succeed in learning one of these trades means a chance at making it in life when they become husbands and fathers. I can’t tell you the last time I walked in the rain and enjoyed every moment of it. It started raining just after Oscar and I started our walk. We tried to make it to a shelter before the bottom fell out, but that didn’t happen. Yesterday and last night was the hardest it has rained since I have been here, and wouldn’t you know it, I would get to REALLY experience it! We laughed because it was raining so hard at one point the rain was stinging our skin… so we ran. Now I know all of you are laughing along with me and Oscar as you read this, because I am certainly not in shape to run. Well, or so I thought. It’s amazing at what we can still do even when we are older! Oscar and I made it to a shelter where we sat and talked until it eased up some. I know God intended for us to make it to that shelter where we could talk about Him. What will bless you is to know that Oscar brought our Heavenly Father up almost immediately when we started to talk there in the safety of the shelter. Although we had a major language barrier, we were able to understand how we both feel about the Lord. Oscar shared that they get taken to church every Sunday and how much he enjoys it. Oscar had no idea what a missionary was. It was extremely hard to explain what I was doing. At one point I began quietly asking Holy Spirit to intercede. It was so important that Oscar knew that I cared about him because Jesus cares about him. At my home church in Georgia, Blackshear Place Baptist, they are in “The Year of Serve”. Everyone has been encouraged to spend this year impacting the lives of others by giving of their time, their finances, etc. An example would be to buy a stranger’s meal and leave a track that shares the love of Jesus, cut grass for someone, or anything that would help another; and to share that we are doing it because Jesus loves us and we want to share how much He loves them by serving them. I left just as Serve Strong was getting underway and I have wanted to have the opportunity to do something unplanned for someone. I couldn’t buy Oscar dinner, or help him with his chores or anything, but I gave him the one thing he needed….my time. The afternoon ended much too quickly and I know on this earth I will probably not see Oscar again. But he will be in heaven with me, so I will see him again then. What a joy to walk to church this morning. It was a great time to reflect on the devotion I read before I left as well as gave me ample time to pray for the services. This was my first stepping outside the school campus completely on my own. Once again as I’ve written before, I had such a sense of peace and God’s direction. I wasn’t afraid I would get lost or harmed in any way. It was a little unusual….no not a little unusual, it was a lot unusual that I was met at the entrance of the property where the church holds its services by a guard with a gun. I don’t think they have small guns in Africa, it seems they are always so big or the guards that carry them are so small! If I remember correctly this was the first armed guard I have seen since I arrived here in Tanzania. In Uganda there are armed guards all along the road and other places, but it hasn’t been that way here. I can’t tell you why the property needed the armed guard because I decided I didn’t want to know! God brought me there safely and I didn’t want to be distracted by the what if’s! I arrived a few minutes early and was blessed a couple of minutes after I arrived to meet a young lady named Sarah. Her English was very good and she shared that Mama Lois, my teacher who invited me to come had been in her life since she was 5. It was very obvious that Mama Lois and her husband who is the Pastor there are loved very much. When she learned I was one of Mama Lois’ students she insisted I practice my Kiswahili with her. She told me once church started because I was a visitor I would be asked to speak to the congregation and tell them about myself in Kiswahili! Okay, just so you know I didn’t run away, although the thought crossed my mind! I decided that just as God had delivered me safely there, He would help me communicate. I did okay on the first couple of sentences, then I got tickled at myself and laughed and the whole congregation joined me! How wonderful that brothers and sisters in Christ can show their love for God and for one another no matter the language barrier. I think they will remember my laughing more than they will remember what I was trying to say. It was a wonderful first time experience making my first Kiswahili speech. There were lizards inside and other critters, but it was a precious little church room. They didn’t have any pews or a choir loft or any musical instruments there. As the congregation began to sing, the tears began to flow as the songs they were singing were the precious old hymns I knew from home, only with Kiswahili words. From the church chair (which was a plastic chair) I sat in, I could see the great Mount Meru out the door. It had a cloud circled around the top of it. It reminded me of my devotion yesterday when I read in Exodus about Moses going up into the cloud on top of the mountain to meet the Lord. I know that the cloud on Mount Meru was not the same thing, but it made me think; maybe the Lord was up on top of Mount Meru this morning listening to His children sing as our voices drifted upwards. Eventually I closed my eyes and listened to the beautiful voices around me. I thought about how little they have here materially as a physical church, but how rich their lives are as a family of believers in their relationship with our Heavenly Father. This little congregation impacted my life today, I will never forget them. Friday afternoon has arrived. Two weeks of Kiswahili completed and one remaining. I thought you might like to see what I learned today, and be able to understand why we were given 10 pages of homework for the weekend. 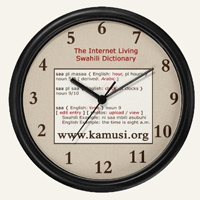 I found this illustration of Kiswahili time online at http://www.kamusiproject.org/?q=swahili_clock that can better explain the time here. It’s not just the numbers in a different place, read the message below where this same website gives a great description. What is Swahili time? Swahili speakers count time differently than most other people. In Swahili Time, 1 o’clock in the morning is the first hour after sunrise (what everyone else calls 7:00 a.m.), and 1 o’clock at night is the first hour after sunset (what the rest of the world calls 7:00 p.m.). Why? Because most Swahili speakers live close to the equator, and on the equator the sun rises and sets at the same time every day of the year. Unlike countries far from the equator, where sunrise in June might occur at 4:30 a.m and sunrise in December might be at 8:30 a.m., the sunrise in the Swahili speaking world is so consistent that you can set your clock by it – so people do. Its a bit tricky to catch on, but once you do, I find it easy to know the time if you can look at both clocks at the same time. However, writing out the time is another matter. The clock above indicates 4:10 and thats easy to determine. But this is how you write it: saa nne na dakika kumi! Many people here now set their watches using standard time which is great. However, any speeches, etc are given in Kiswahili time. The school schedule and all the clocks are regular clocks with standard time, but when someone here speaks to you about time, it is Kiswahili time! Looking forward to attending church Sunday with one of my teachers. I knew she was a Christian but found out today, she is a Pastor’s wife! That explains why throughout my time with her, she makes great comments when I use the bible or Christian illustrations when I am writing a sentence. I will walk to their church and join them. She said their services are from 9:15 until 12:15! Or should I say from saa tisa na robo mapika saa kumi na mbili na robo! I am looking forward to worshiping with them. I might even understand some of the words! Must close now, no more time to write, must get busy on homework. Yesterday our class began role playing going to the market. This was in preparation of actually going to the market today as a class assignment. First of all I should describe the market place itself. It’s a big dirt area, probably about an acre with all types of old tarps spread out on the ground. Down the middle of the market are some structures that sellers are able to tie their tarps above them for shade. The outer part of the market has non food items such as shoes and clothes. I need to be a little more descriptive about the shoes and clothes, they are all used shoes and clothes. There are no new items here. There must have been thousands of shoes, I can’t imagine where they all came from. I took a moment and watched the buyers as they went through looking for a matching pair and I realized they are just as happy to get a used pair of shoes as we are to get new shoes. And, they won’t be getting a credit card bill at the end of the month because you don’t use credit cards here! After exploring the outer part of the market, I had to take a deep breath and find the courage to complete my class assignment. I had to purchase banana’s and could only speak Kiswahili to do so. Now it wouldn’t have been too bad if I could have just walked up to the person, pointed to what I wanted, and paid. But the lesson wasn’t just to purchase banana’s, I had to negotiate the price. So, I found myself being really stretched! Here I was on my first assignment to have a conversation in Kiswahili which is a huge stretch. Then I was required to negotiate a price which was already too low. I don’t know how to negotiate, I only know how to smile and say sure and hand over the money. Yet, I am happy to report that I followed through and purchased 30 of the little sweet banana’s for 1000 shilings which is about $1.30. An additional purchase had to be made for a plastic bag to put the banana’s in. These bags are sold by very poor young boys probably 11 or 12 years old. I must admit it is a struggle for me here in Africa to see so many hungry, hurting children and not be able to help. I tried to purchase my plastic bag from a boy who seemed to have lost hope. It is easy to tell which ones these are because of their faces. Once the task was completed I walked around and enjoyed the people. This market was full of hundreds of people and they were all happy. You would have thought they all belonged to the same family. When someone comes to this market, they arrive by walking or by taking a small van. These old small vans normally seat 8, but you don’t see one that has less than 10 or 12 in them. Not only the people but all of the goods they purchased at the market. For the women who do not have the money which I think is about 10 cents to ride in one of these vans, they bring a basket and once they’ve completed their shopping someone helps them put the basket on top of their head and they walk many miles back home. Let’s remember the children here and throughout the world who are hungry and hurting and most often alone. Who will be the one to come and buy the next plastic bag? 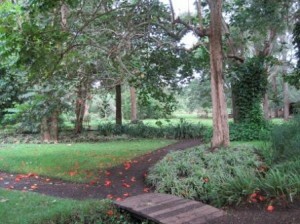 This morning for the first time since I arrived, I saw Arusha. When I arrived here it was night and today was the first offered excursion. I didn’t know what to expect because the grounds and facilities here at the school have been so different than any other area I have been in Africa. As we pulled out of the campus gate onto the road I realized immediately it was nothing like the campus, because the first thing I saw was a man carrying a load of stalks of some sort on his head. Then there were the children minding the cows on the side of the roads and women walking with all sorts of things on their heads. As we drove by field after field there were workers bent over in the heat of the day working diligently. The drive to the town of Arusha was about a half hour from school. No where along the way did I see any huts. Most all of the structures I saw were block or wood and a power line ran along the highway. It was clear that this area is more advanced than Busia. When we arrived in town and departed the bus, we were bombarded with local people hassling us to buy their goods. This has been the case everywhere I’ve been and I must admit it is not a pleasant experience. You don’t want to be rude, but there will be 4 or 5 at one time surround you. The bus dropped us off at the book shop as most of us needed books for school. As I was going in a young man introduced himself as Robert. He had some things he wanted me to look at in hopes I would buy something. I told him that I was there to shop for the book I needed for class. He was very polite and told me he would wait for me to finish. For any of you who know me well, you know I have a deep passion for books. To be in a book shop in a different country was amazing, so I thought this guy has no idea how long I will be in this shop. He will be gone when I am finished. I am sure you have already guessed that when I came out, he hadn’t left. He asked once again for me to look at his paintings, and once again I told him I was not interested. I told him that I was only here to see Arusha and not to shop for anything other than the book I’d just purchased. So, he changed his tactics and decided that I needed someone to protect me. By this point this young man had been very nice, polite and considerate…and I truly laughed at his persistence. So, I told him that he could walk with me if he would teach me about his culture. He said, “You mean you don’t want to visit any shops for purchases?” I said no, I want to see how people here live and be able to understand more of Africa. I told him what I am doing in Uganda and why the information would be valuable to me. At this point everything changed…this young man became a delight and joy to be with. Now here I am again telling you that this amazing sense of peace and no fear is so a God thing. 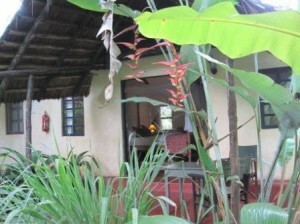 Robert took me to the people of Arusha. He protected every step I took from clearing trash or anything I might trip over out the way, to showing me how to wear my sling bag so no one could steal it. He taught me how to tell the difference in a person in need and a person with greed. He taught me how to look at situations like which Mothers with children need the most help. He helped me understand why there are Mothers on the streets with children. He shared that just like all over the world, a young woman makes a mistake with her boyfriend and finds herself expecting a child. He said when the boyfriend finds out about the child, he leaves the girl. When the baby comes, there are those who come in the beginning, neighbors or someone who knows her circumstance and they help her a few days, then she is left on her on. The days she has help she has regained some strength and she has been given food, but then the food runs out and she finds herself starving. She is not able to produce milk the baby needs and she does the only thing she can do to get some money… which ultimately leads to another child being born. Every street we walked down had homeless Mothers with their babies. Oh, what a helpless feeling it was for me. In the 3 hours he walked with me and shared about life here, I learned more about the culture, etc than I have since I first began to learn about Africa. I will never forget Robert and I ask that you pray and ask God to bless him and his family for his kindness to me. He and his wife have 2 little boys who are just getting over Malaria, so please pray for them to recover completely. When I got back on the bus I knew I had just experienced a divine appointment. When we returned back to the campus and began our dinner, I listened as all of these people who were on the same streets I was on never saw the hurting. They talked of the shops and the goods they purchased and my heart broke. Tonight is the ending of a wonderful weekend. Today 8 of us from different Kiswahili courses took a trip to Arusha National Park which is 20 minutes from the school, and is home to Mount Meru. What an incredible adventure! We spent 6 hours driving through the mountain type roads in the park…it was amazing. In several different parts of the park you could see Mount Kilimanjaro in all its majesty. So regal above everything else…covered in snow. When my children were growing up we loved to go ride through the mountains on the dirt roads. Especially just above Helen, Georgia where there is a dirt road that is 22 miles. That is exactly what this was like today… beautiful. We saw all kinds of African animals and birds. Now it’s time to refocus on class for in the morning. As I’ve been writing, I remembered a blessing to the washing clothes by hand that the women of Busia, Uganda do not have. I didn’t have to go get the water from a pump and carry it on my head to bring it back to wash my clothes. 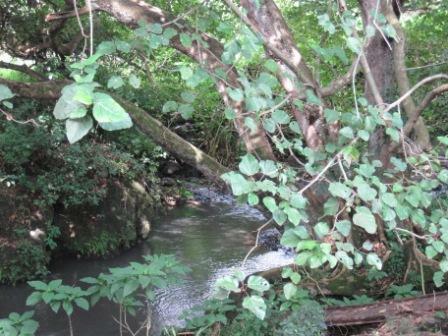 I didn’t have to go down to the river where all the animals are and wash my clothes in the same water the animals were in. Most definitely I am not going to complain….I am most blessed. Praise the Lord; I made it through the first week of school! I really mean I am giving much glory, honor and praise to the One who answered our prayers and helped the week end much better than it began. At the close of school today I could speak not only more Kiswahili words than I ever imagined, but construct sentences as well. I continue to be better at writing and reading it than saying it, but my teacher says by the end of next week my confidence level will increase. All of the faculty and staff here at the school gave us a break the first few days, but now they intentionally approach us, speaking to us in Kiswahili. It is all done to help us and also because they get a great deal of joy in putting us on the spot! The teachers and everyone else here have been trained to give help and encouragement. If you mess up, they encourage you that you will get it right the next time. If you speak correctly they are quick to give you a word of praise. From a health standpoint, I am doing great. Throughout the week the food has been excellent and all around the campus there are water coolers with purified water within for us to drink. With the exception of the first few night’s adjustments to the time change, I haven’t had any issues. The weather changed a couple of days ago as the rainy season is beginning. Now around 4 in the afternoon the rains begin and it rains just a slow steady rain until bedtime. This has made the sleeping conditions incredible because we sleep with our windows open and the roof is tin. The only struggle I’ve had other than the first part of the school days is a struggle with spiritual warfare. Many years ago the Lord began to teach me about spiritual warfare, and before I left to come here I can testify that the warfare increased greatly. From what I read from other missionary’s accounts, I was prepared for the warfare to increase when I arrived, yet not at all sure of what to expect. Night before last was an unusual night. I went to sleep just fine and about 4 in the morning I was awakened. Before I say more, please understand that I am not an expert in spiritual warfare; I can only share the things I have experienced and come to understand. When I woke up there was a presence nearby. I don’t believe it was in my room, I believe it was being held off from coming in, yet somehow I knew it was there and I knew it wasn’t good. Here where the school is located, it is remote, so at night you cannot hear any human made noises. The only noises are from God’s incredible night creatures outside. As I lay in my bed in the quietness of the dark, I began to pray. I realized I wasn’t sure exactly what to pray, so I began to quietly say Jesus, Jesus, Jesus over and over and in just a bit that presence was gone. After such an experience going back to sleep was not an option, so I got up and went to my daily bible reading to begin my devotion. This is what I read: Exodus 14:14 “The Lord will fight for you, and you have only to be silent.” Isn’t that something… to share! I didn’t have any idea how to fight what was near me other than to say the name of Jesus, yet, this scripture helped me to understand that there must be many times before that hour of my life that evil has come against me and I did not recognize it enough to call out to Jesus, and yet the battle was being fought although I was silent. When I finished my reading, I began to think about how different it is here. I was thinking about the silence of not only the night here, but also the days and evenings. When I am in my room the only sounds I hear are of nature unless someone walks past. The Lord has always spoke to me through His nature, however, since coming here I am recognizing not only the peace of silence but natures sounds, etc more and more because there are no other noises that I have to filter out. It made me think about how it is back home. There is really never a time that we have true silence or true darkness. 24 hours a day there is always something making a noise even in the night. The clock is ticking, the heater or air conditioner is running, the ice maker is running and on and on. Here it is just the opposite and the darkness is amazing here. Back home there is always light filtering from some source; clocks, TV, DVD players, street lights and so on. But when darkness comes here, you cannot see anything but the stars in the sky. When there is no moon, you can’t see your hand out in front of you. I was thinking about the Saints we read of in scripture, as well as our Fathers, Mothers, Grandfathers and Grandmothers who left us an incredible legacy of closeness to the Lord. I am beginning to imagine that this is somewhat like their lives was as far as sound and darkness. Could it be that the lives we live have become so saturated with noises and light that we never are truly quiet enough or forced into the darkness enough to recognize the voice of the Lord and sense the power of His presence? And, this would also be true for the forces of evil. Are our lives so full of distractions that we don’t hear or sense the enemy approaching? It is really something to think about isn’t it. Wow! What a difference prayer makes! Yesterday just after I posted the last post about struggling with the Kiswahili course an amazing thing happened. A new student who had just joined our class that morning came looking for me and asked if she could help me with homework. She told me that she saw that I was struggling and she wanted to help me if I would like for her to! She was a great tutor and in just a matter on minutes she had me on the right track. She gave up her first evening here to help me. Today I wanted to do something nice for her because she was so nice to me. There are no stores here or anywhere to purchase a gift so my resources were limited. Holy Spirit brought to my mind that she had shared with us yesterday about just coming from serving in the Congo where she had been remote for sometime. You remember me telling you about those 50 pound bags of luggage that I thought I was going to have to fight for…….. well, God had a plan that I couldn’t see when He allow that customs agent to approve them. I made this new friend a goody bag with all kinds of things she could enjoy! She cried when I brought it to her!I don’t believe she is a Christian, so God is going to use all of these circumstances to show His love for her through me. Then this morning when class started we were told they were splitting the class into two classes. They have a minimum of 5 per class and we had reached 7. They divided our class and 4 stayed with the current teacher which was great because these 4 were the most advanced. Then the 3 of us left were given a new teacher. Now all of this is already answered prayer, however, it gets even better. The other 2 students missed class yesterday so today we did review!!!!!!!!!!! Isn’t our God so amazing. He sent me help last night that gave me the foundation I need to go forward. Then today, we went back over what had been so confusing to me yesterday. From the depths of my heart, I am thankful I serve a God who cares about all of the things in my life, and thankful for family and friends who I trust to pray for me. I know that God could have answered my prayer if I hadn’t asked you to pray, but I don’t think He meant for me to carry the burden alone. I believe there is probably someone who is going to read this update and be encouraged to share their own burdens with another. (I’d love to pray for any of your needs too!) There is sooooo much power when God’s children are praying. Speaking of power….. since I wrote the last sentence, we have lost power 4 times. There are evil forces here that don’t want me to give praise and glory to God for what He is doing. Yet, class is over for the day and all I have just now is time to wait it out where I could finish. I’m so glad the Power of the God we serve is greater than any evil that comes against us. Day two of Kswahili class and I am a bit overwhelmed….wait not a bit…a lot! I’ve just came from class and the verse in Philippians 4:13 is going over and over in my mind. I am trusting that although I know I cannot do this within my own strength or knowledge, I can do it because it is Christ who is providing the strength and knowledge. There are 2 issues that prevent the learning process being so easy for me. First, leaving high school before finishing left a huge void of knowledge, especially grammar, etc. Although I went back later, the process of learning was not as in-depth as it would have been had I finished high school straight through. Of course in order to have finished school this way I would not have the most incredible son and daughter who were born to me when I was a teenager. So, if I had to do it over again, I would do it the same way! Although it is difficult to learn without many of the basics, I know with hard work, determination and total dependence on Christ, I will eventually learn it. Sometimes I think because of my lack of knowledge, it has caused me many times over the years to work harder to achieve my goals. Therefore, I became more proficient in the areas I had to work harder in. I am trusting this will be true once again. The second issue is that all of the students in our class not only have their secondary college degree’s, all of them speak more than one language and have gone through language courses previously. Also, all of them have already been working in their current positions here in Africa for at least a few months, so their exposure to the Kswahili language is helping them catch on quickly. It may seem that both of these issues are issues that would not be easily overcome, and that is so. However, God would not have brought me here to be equipped with this tool if He were not going to provide the knowledge needed to attain it. As I am finding with the life of a missionary, easy is not a part of the process! Thus far, many things have been difficult, yet here I am on the mission field having overcome them all through Christ. Just think if it were easy, what a boring message I would be writing. Now you will be waiting to see how it all turns out. Eventually, because of these challenges, I will be writing home praise reports of how God helped me learn this language. So, all in all, maybe it should be this way where I can give Him praise and glory instead of thinking I did it on my own. If you’d like to offer up some prayers on my behalf….it would be in order to do so quickly! We were given 6 pages of homework…………… Love to all. The Life and Mission of Joy Breedlove is powered by	WordPress 3.4.2 and delivered to you in 0.218 seconds using 38 queries.